Safety PLC with 8 failsafe inputs plus 8 non-failsafe outputs/failsafe inputs plus 2 individual failsafe relay outputs plus 2 individually failsafe transistor outputs. 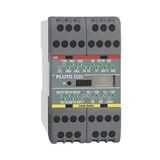 For use with Pluto safe bus and/or a Pluto Safety databus. 4 0-10V/2-20mA analog inputs.